Michelle Pfeiffer Heals me with an Eagle’s Feather. In the Summer of 2009, I picked up my phone and noticed a slew of missed calls, some of them from Michelle. I couldn’t talk to her. I couldn’t talk to anybody. I was so miserable. So distraught. Another half hour passed and Michelle’s number was blinking on my screen as she relentlessly called again, so I picked it up this time. We spoke about the intimate romantic split that left me in pieces when she then convinced me to pack my bags and let her pilot fly me up to her abode for the weekend. She had lost her father years before that due to Cancer and I remember being amazed at how strong she was and how she just took over for the family. It was the same way I would be when my father would pass away a year later. Michelle and David (husband) live in this massive $25 million dollar ranch estate in what is considered one of the richest areas in America in Northern California. Being around them is like being dropped into the epicenter of unwavering love and serenity that swallows you up whole. The weekend in Northern Cali ended up being a bigger defining moment that snapped me out of the pain or at least alleviated the pressure. I would never allow it to get that bad again. And it never did. It’s just not allowed anymore. It felt good leaving the city I was living in if even for a long weekend. I needed to get away, run away, hide away. I had enormous trepidation before making the trip, but once I was on my way, this feeling of relief overcame me that I hadn’t felt since the split happened. When the plane landed, Michelle was already there waiting to pick me up in her dark jet black Land Rover, since she’s never late to anything. She climbed out and her presence at the airport created a bit of a buzz since she is pretty well known in Hollywood films. I perked up slightly, “Shaman?” Like me, she’s always been into all sorts of spiritual type things. She brought me into one of the rooms in the house to meet this man who was a Native American Indian there with his wife. He had the most gentlest profound eyes I’d ever seen. It gave me a glimpse into this incredible doorway that led to many lives past. “Do a healing prayer I think.” Michelle replied. The guy smiled nodding in agreement. He had me lay down and then proceeded to walk around me while touching me with the most beautiful Eagles feather my eyes had ever gazed upon. “It’s very spiritual.” Michelle chimed in. I’m being healed by a feather, I thought. This is kind of like Reiki. At this point nothing seemed real and this was beginning to actually feel normal and calming to me. The guy and his wife started letting out Native American Indian chants when all of a sudden I felt this enormous powerful lift from inside my body as if some darker presence was being yanked out of it. It was like there was a demon stuck in there. I couldn’t help but wonder that he really did something to help. We took a break before he would work on my back next. After that weekend, I morphed into a cocoon only to emerge a year and a half later at the end of 2010 more powerful than anyone had ever imagined. I decided to come out of the spiritual closet in a big way and begin talking about the “light” and the “others” in my work regularly. I gradually realized that it was also helping others. No one would ever be able to get me to shut up about it from that point on. 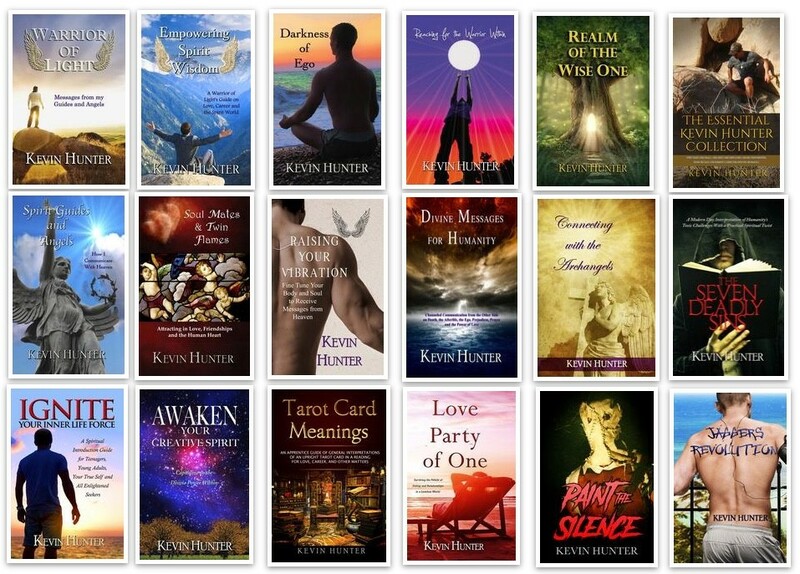 Posted on March 19, 2017, in Empowerment, entertainment, Entertainment Industry Stories, Inspirational, Kevin Hunter, Kevin Hunter Author Writer, self help, Spirit Guides, spirit team, Spirituality, Spirituality For Men, Wise One and tagged Channeling, Healing, Kevin Hunter, michelle pfeiffer, Shaman. Bookmark the permalink. Leave a comment.